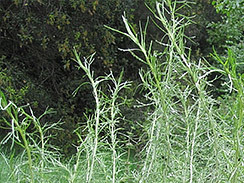 A prolific chaparral wild plant, California Sagebrush (Artemisia californica) grows near most hilly and mountain trails I explore. 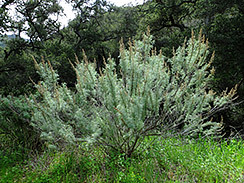 It can grow from several inches tall with a few stalks when young, to large round bushes 5-8′ tall. The stems are slender and flexible with thin threadlike leaves ranging from 1/2″ to 2 inches long. Leaves vary in color from light bright green when young to mature green gray. 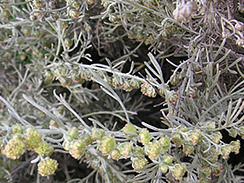 Foliage is sparse and airy. Small florets, sometimes yellow, sometimes reddish or brown, dangle like little spice balls from the plant’s downward-dangling tips. The plant is incredibly aromatic with a wonderful sage-like smell. It was formerly used in dried bundles to sweep homes, hence its name. Use the dried “spice” balls sparingly, to flavor soups, meats, salads, etc. Fresh leaves can be used to flavor vinegar, oils, etc. Dried leaves can be used sparingly as a spice.